We departed Old Forge under sunny skies and a temperature of 54 degrees on Sunday, October 10th at 12:15PM and after a brief stop to bid farewell to our grandchildren in Woodgate we were on our way south! Crossed the border into PA at 4:10 and arrived at the Hampton Inn at Chambersburg at 7:15. We enjoyed dinner at the "Cottage" ~ Izzie had Scallops and I had "Chesapeake Chicken", i.e. chicken breast stuffed with crap meat ~ not bad! Hit the road again at 11:05 AM under sunny skies and 75 degree temperatures. Had a pleasant drive through Maryland, West Virginia, Virginia, North Carolina, and finally into Rock Hill, North Carolina at 6:35PM. Much to our dismay we learned that our favorite restaurant in Rock Hill, "Harry & Jean's", closed in May so we had to find another eatery. After some home work and a drive around the area we decided on the "Amber Buffet" an oriental restaurant that features an amazing buffet. After dinner Izzie went shopping for a good exercise DVD and found a more advanced version of Leslie Sanzone's "Walk"! The next morning under more sunshine and great weather we headed out for Florida at 11:00. We checked into our town house at LaFiesta on Anastasia Island at 5:30 on Tuesday. True to our "first evening" tradition, we had dinner at "Amici's". Had a great meal and attempted to consume a full carafe of wine! Made it back to our town house and passed out for a good night's sleep. We started Wednesday with our traditional 2 mile walk on the beach followed by breakfast in our room. We did some grocery shopping at the Publix, got settled in our town house, and then did some pickin' with me on banjo and Izzie on her C.F.Martin travel guitar. I did some photography taking some shots of the gardens and flowers around our town house. Dinner that evening was at "Cafe Atlantico" ~ the best restaurant on the Island! Izzie had the imported mozzarella, portobello, spinach, eggplant, zucchini tower for an appetizers and a wonderful Veal Chop with garlic mashed potatoes, and spinach with garlic, red peppers, and mushrooms as her entree. For my starter I had the "Caprese Salad" that featured Roma tomatoes, Fior di latte mozzarella, basil, & arugula. My entree was the New Zealand lamb loin chops, served with spinach, fettuccine, goat cheese, and rosemary emulsion. Our server, Aslyn, was a delightful young lady who helped to provide us with a most enjoyable evening. 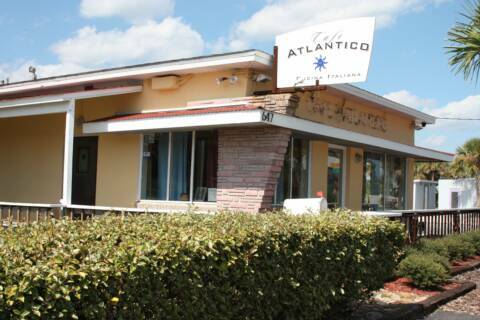 After thanking, Paolo Pece, the owner/chef at Cafe Atlantico we headed home. We were off to a great start on Thursday with our morning walk, in-room breakfast, and a trip planned to buy our annual supply of Wine at San Sabastian winery when all hell broke loose. As we were looking for a post office to mail invitations to an upcoming Library event, one of St. John's County eager-beaver patrolmen pulled me over and gave me a ticket for $100.00. I forgot my seat belt! Oh well ~ that's the price of being a New Yorker in Florida. The sad part was he wouldn't even help us find the Post Office! After finally finding the Post Office and mailing Izzie's letters, we made it to the winery and purchased our two cases of wine! That evening we went to "Salt Water Cowboys" for dinner. Justin, our server, recommended the "Oysters Dondanville" as a starter ~ wow, he was right! ~ they were divine!! Izzie had the Baby Back Ribs and I the Shrimp & Scallop combo. Izzie ended the day with her Leslie Sanzone "Walk" video. With our morning walks on the beach Izzie gets in a good 5 miles a day! Friday's highlight was our visit to the Whetstone Chocolate Factory on King Street in St. Augustine. We had a great tour and had the opportunity to sample some of the outstanding chocolate products they make. (Click here to see our tour>). After late afternoon jam session we headed back to Cafe Atlantico for another great evening of fine dining ~ Izzie had the Tuscan style garlic sauteed shrimp with cannellini beans & spinach for an appetizer and the Potato dumplings "gnocchi" with shrimp & scallops served with mushrooms, cherry tomatoes & broccoli as her entree. I had the Mozzarella, portobello, spinach, eggplant, zucchini "Tower" to start and Paolo's special Lobster Ravioli as my main course. Then it was back home for a good night's rest. Saturday was a lazy day. We took our morning walk, played music, ate the Il Villaggio marinated mozzarella cheese & Flatbread Sea Salt & Olive Oil Crisps we had purchased at the Publix, and we uncorked a bottle of the Reserva premium white wine from the San Sebastian winery. The weather has been spectacular for our stay in Florida ~ we have had beautiful blue skies, warm days with temperatures in the mid-80ies, and cool, clear nights. And the prediction for the next 4 days is great! It doesn't get any better! Dinner Saturday night was at the Wild Flower Cafe. They feature slow roasted Prime Rib every Saturday evening. After dinner we took a drive south for about 10 miles on A1A to Matanzas Inlet to watch the sunset over the Fort that was built in 1740 to help protect St Augustine from a river attack. (See our snapshots>). We ended our day by purchasing Ice Cream cones at Fiesta Falls next door to our Town House. Sunday we headed for the Old City to sight-see, consume some fine Gelato, and do some shopping. On the way back we decided to explore a new St Augustine walkway from Old US Route 1 to the ocean ~ very picturesque! We had Sunday dinner at Mango Mangos, a little beach-style restaurant down the road from our Town House. Izzie had a really big Fish Sandwich with Sweet Potato Fries. I had the "Island Paradise Chicken" ~ a tortilla encrusted chicken breast dusted with the right spices, deep-fried, topped with a cheese blend, avocado, sour cream, and a Cajun mango sauce. For my sides I had the Sweet Potato Fries and Black Beans. We both had a cup of their Clam & Shrimp Chowder ~ Then back home to watch a movie and rest up! We started our Monday this week with a hike down the beach for Breakfast at the Beach Comber. Izzie had her favorite ~ pancakes with an egg over light. I had the Veggie Omelette with home fries. Monday afternoon we headed south on US A1A to look for some interesting photo shoots. Got some nice pictures of birds along the Matanza River and the Intercoastal Waterway ~ then we lucked out at Butler Park Beach along the Atlantic coast just south of St Augustine ~ while birding we stumbled on a pair of turtles performing their mating ritual. The photos aren't the best (turtles are a bit shy), but I think we did well considering the conditions we had to shoot under. We ended the day with another fantastic dinner at Cafe Atlantico. Our server for the evening was a young man named Conner. Due to the number of patrons at the restaurant, Michelle, our server for the past three years, stopped in to help out. It was nice to see her again. Paolo always hires outstanding and talented young people to work for him. After our Tuesday morning beach walk, we headed west across the state to visit family in Alachua. We had a wonderful afternoon visiting and catching up on family news. 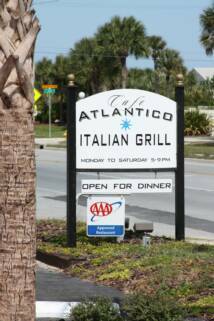 Enjoyed a scenic drive back to St Augustine where we had our last Florida dinner for this vacation at Amici's. Wednesday morning we packed up and set out for South Carolina ~ the first stop on our trip back to our home in the Adirondack Mountains.